The 2019 Ford Figo comes with a host of cosmetic changes and a new top-spec BLU variant. It gets a new top-spec BLU variant. The 2019 Ford Figo Facelift gets two new petrol engines. Ford India has finally given the Figo a much-needed facelift which comes three years after the hatchback was first launched in the country. 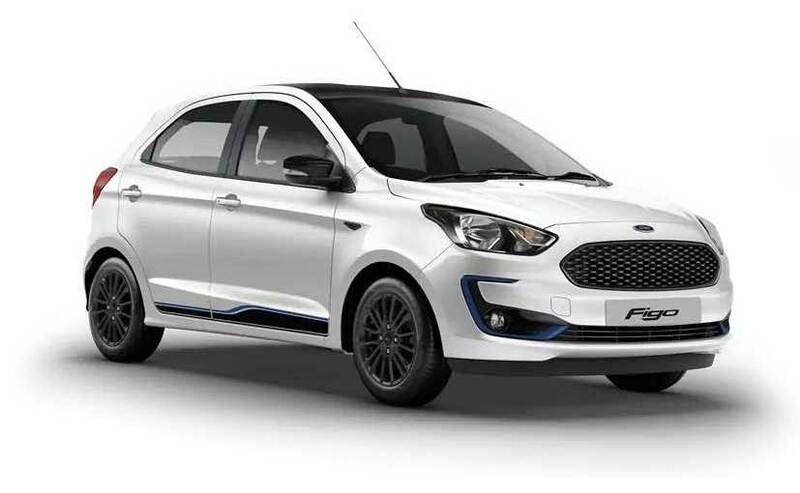 The 2019 Ford Figo Facelift has been launched at a starting price of Rs 5.15 lakh (ex-showroom, India) and the 2019 Figo has been comprehensively designed with 1200 new parts. Ford has made a host of cosmetic and mechanical changes to its premium hatchback which is almost identical to the ones we have seen on the Aspire facelift. For starters, the new Figo gets a revised face, tweaked rear and an updated cabin along with two new petrol engines. These new engines are from Ford's new Dragon engine family seen on the new Ford models like the Freestyle and the Ecosport. 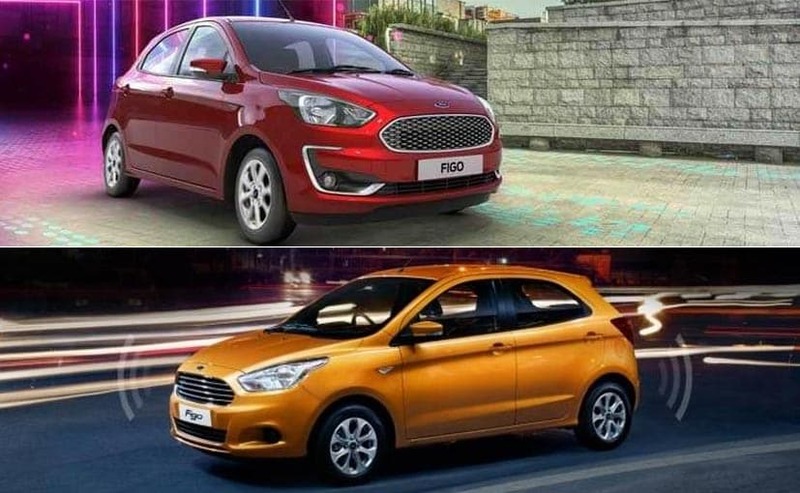 So what all is new on the 2019 Ford Figo facelift? The top-end BLU variant gets black finished radiator grille, matte black 15-inch alloy wheels and blue detailing. Ford has modified the face of the new Figo very aptly for a facelift and this is an area where the changes are most apparent. Upfront the facelifted model gets a new honeycomb pattern grille doing away with the old grille which came with slats. The grille on the top-spec BLU variant though is finished in gloss black in a bid to give it a sporty character. The front bumper has also been re-profiled and sports a handlebar-mustache-like black design housing that incorporates the central air dam and circular foglamps which are fringed with C-Shaped chrome (electric blue in the BLU variant) on both the ends. The dimension of the car has not been changed and the overall design on the side is the same while the BLU variant gets new multi-spoke alloy wheels finished in matte black and new wing mirrors. At the rear, there are revised taillamps while the bumper profile remains unchanged. The BLU variant also gets an all-black cabin and blue highlights on the dashboard and door pads. 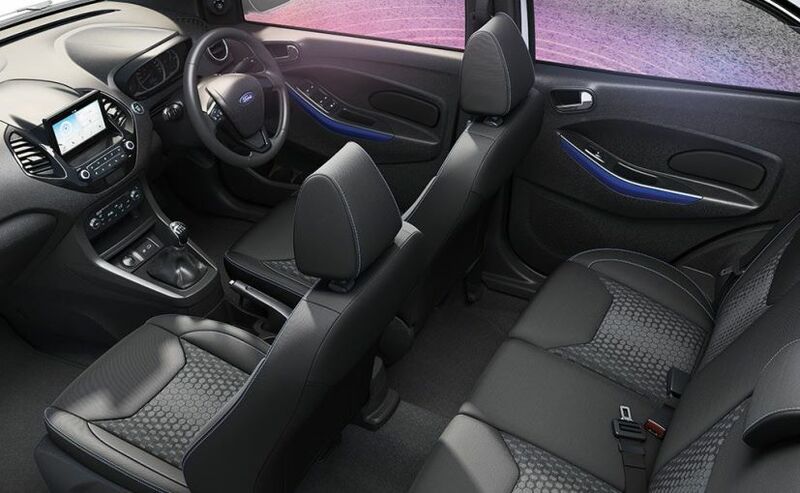 The cabin of the new Figo is not entirely new but Ford has made some significant changes that distinguish it from the old model. It comes in the similar beige and black dual-tone interior theme but the seats have been restyled to offer better support. However, the BLU variant has an all-black cabin with blue highlights on the door and dashboard which makes it look really sporty on the inside. The dashboard has been revamped too and the central console also has been updated with a new 6.5-inch floating touchscreen unit similar to that seen on the Ford Ecosport facelift and the new Ford Freestyle. Albeit, the Figo even now doesn't get smartphone connectivity options or the Microsoft SYNC. The facelift has also added some more bells and whistles in the new Figo. The 6.5-inch touchscreen provides access to Ford's new in-car connectivity SYNC 3 system which is equipped with Apple CarPlay and Android Android Auto. Moreover, the new Figo is still equipped with upmarket features like auto climate control, an engine start-stop button and illuminated USB sockets. On the safety fronts, along with dual-airbags and ABS being standard across the Figo range, it gets an edge being equipped with electronic stability program (ESP) on the top variants and the new SYNC 3 as before has the Emergency Assistance feature that notifies the nearest hospital in case of a collision. Furthermore, as the pre-facelift model even the new Figo come with the speed limiter that can be controlled with either of the two key fobs helping the owner to control the speed-limit when some other driver is behind the wheels. The most significant change that the facelift has brought with it is the engines on offer. Both petrol motors are from Ford's Dragon engine family. The smaller one is the 1.2-litre, three-cylinder motor that made its debut in the Freestyle while the bigger 1.5-litre, three-cylinder unit which was introduced with the Ecosport facelift. The 1.2-litre petrol motor produces 94 bhp and 120 Nm of peak torque and is mated to a five-speed manual gearbox as standard. Ford claims that this motor delivers a fuel economy of 20.4 kmpl. The bigger 1.5-litre petrol motor develops 123 bhp and 150 Nm of peak torque and comes with only a six-speed automatic torque convertor unit; there is no manual gearbox available with this engine. It delivers a fuel economy of 16.3 kmpl. However, the extra power this engine offers comes with an added cost. It takes away the tax subsidy which is limited to 1.2-litre displacement for petrol motors in a sub-four metre vehicle. The diesel variants of the new Figo are powered by the same tried and tested 1.5-litre, four-cylinder TDCI motor that was the workhorse in the pre-facelift diesel Figo. This engine develops 99 bhp and 215 Nm of peak torque and is married to a five-speed manual gearbox as standard. Sadly, there's no automatic on the diesel. The claimed fuel economy for the diesel Figo is 25.5 kmpl. The 2019 Ford Figo is offered only in three variants. Prices for it start from ₹ 5.15 Lakh for the base Ambiente petrol variant and go up to ₹ 7.74 Lakh for the top end Titanium BLU diesel variant.